Adrian Podoleanu, Professor of Biomedical Optics at the University of Kent, has received a prestigious international award. 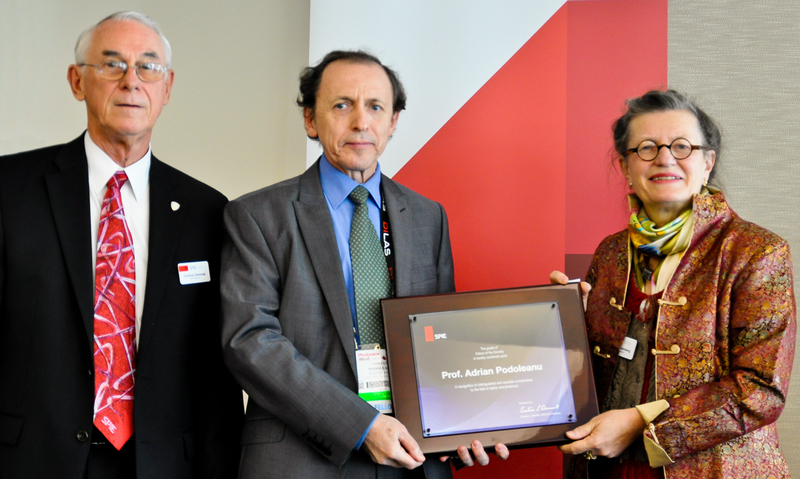 Professor Adrian Podoleanu receiving his SPIE Fellowship award from past and current Presidents, Dr Katarina Svanberg and Professor Eustace Dereniak. Professor Podoleanu was made a Fellow of the International Society for Optics and Photonics (SPIE) during its annual Photonics West conference in San Francisco, USA. SPIE was founded in 1955 to advance light-based technologies and now has over 180,000 members in more than 170 countries. Fellowships are awarded to members who have made significant scientific and technical contributions in the multidisciplinary fields of optics, photonics and imaging. SPIE is the international society for optics and photonics founded in 1955 to advance light-based technologies. Serving approximately 180,000 constituents from more than 170 countries, the Society advances emerging technologies through interdisciplinary information exchange, continuing education, publications, patent precedent, and career and professional growth. In 2010, the Society provided more than $2.3 million in support of scholarships, grants, and other education programs around the world. SPIE publishes the SPIE Digital Library, containing more than 325,000 research papers from the Proceedings of SPIE and the Society's 9 scholarly journals with around 18,000 new papers added each year, and more than 120 eBooks from the SPIE Press catalog. The SPIE Press publishes print monographs, tutorial texts, Field Guides, and reference books. SPIE also publishes a wide variety of open access content. Membership includes Fellows and Senior Member programs. The Society has named more than 900 SPIE members as Fellows since 1955, and implemented its Senior Member program in 2008. SPIE's awards program serves to recognize outstanding contributions from individuals throughout the scientific community regardless of membership status. The University of Kent was established at Canterbury in 1965 and has now become known as the UK's European university, with students in Brussels and Paris as well as at its other Kent campuses at Medway and Tonbridge. It has nearly 20,000 students, of which around 17,000 are undergraduates and approaching 3,000 are postgraduates.